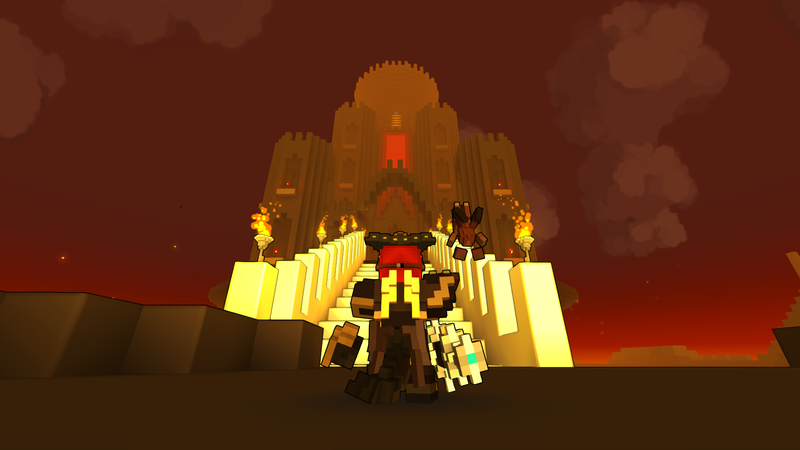 Last week I wrote a post on 10 reasons why you should consider playing Trove, however as my notes on what I love about the game or the details I find interesting continues to grow, I don’t think a “top ten” article covers the game well enough. It’s not that I think Trove is the best game I’ve ever played, but I do think it is underrated largely because most of us don’t know enough about the game to risk giving it a try. With a market as saturated as the MMO genre, it’s understandable that we all want a little more information be it from the studio or via word of mouth before we dive into a new title. So rather than a “10 more reasons” follow up post, I’m going to do a series of articles that will hopefully paint a better picture of what the game is like in order to give anyone interested the intel needed to decide if this game is for them or not. For today I’d like to point out some of the multiplayer-friendly features that give Trove a nice “we’re all in this together” feel. When you are gathering materials for crafting, any player close by will receive duplicates of those same materials. For those of you who have played MMOs without shareable nodes, you’ll understand why this is such a jewel feature. It’s even better than shared nodes because so long as you stay close you can tag team an area. I like this approach to gathering because it encourages players to stick together and there is no animosity if someone gets to a node before you. For example, there are these giant sunflowers you need to harvest sunlight bulbs from for the gardening profession. It’s a bit of a pain to do alone, but a lot of fun with a group of players. Instead of a race, you get a community activity! And while we’re talking about gathering, I’ll mention a couple of other noteworthy conveniences. First of all, unlike Minecraft, you don’t have to go pick up the materials you gather, they automatically come to you. So if that bit of shapestone you just blasted with your laser falls off the side of a cliff, it will rebound right back into your inventory. Additionally, for several of the crafting mats like mushroom chunks, sunlight bulbs, bottles (which grow plant like in the open world), and enchanted wood, as long as you are mounted you can run right over them to gather. Same goes for anything you plant in your cornerstone as a part of the gardening profession. Similar to the group-friendly status of gathering, when you reach a dungeon you may find that a group of players has already reached the boss, however even if you don’t make it to the final chamber in time you will still receive the XP, loot, and dungeon completion credit toward the daily quest. You’ll still need to physically navigate to the boss in order to pick up the loot (which is unique to your character by the way, no fighting loot ninjas for your rewards), but you don’t even need to tag the boss to receive credit. Yes, this opens up options for players to abuse the system and simply follow others around while they do the work but functionally I haven’t seen that happen. You’d have to be pretty engaged to follow people around (so no AFK) and so most players do the right thing and help each other out for the kill as much as they can. Overall it’s another design decision that favors camaraderie over competition and I for one am a fan of that line of thinking. One of the more surprising choices made by the developers was to omit an auction house or even a universal gold-type currency from the game. Instead, a lot of the crafting materials are tradable and the primary currency used to determine an object’s value (flux) is itself a crafting mat. Basically the economy is a bartering system. Some of you might find this to be an inconvenience; I know I tend to prefer auction houses and as such I haven’t made much use of the trade system. However what I have observed while reading trade chat is that this system encourages players to interact with one another in the same way that group materials gathering, group dungeon crawling, and group shadow arenas do. Shadow Arenas are Trove’s end game for those focused on combat skill. They are group instances with a high difficulty level that are accessed by portals that must first be found out in the open world in the Uber 1-5 zones. Gameplay involves fending off wave after wave of monsters and ultimately defeating a final boss to earn loot and shadow shards that can be used to obtain a variety of desirable items. The portals require a key to enter and the keys can either be crafted (which takes some time to amass the materials) or purchased with real money. Initially I was concerned about the keys being purchasable from the cash shop, and some of you may still fine this a bit too much “Pay to Win” for your liking, however I have recently spent a little more time participating in Shadow Arenas and I find the cash shop keys far less problematic now. My concern was that players who purchased the keys would have an advantage in earning powerful gear and crafting mats for upgrades, however in practice it’s not really an issue because the Shadow Arenas are a group activity. Just having keys of any origin is a benefit to everyone. For example, last night I grouped with seven other people for a string of Shadow Arena runs. Four of us had keys available for the group to share and I never did find out whether they were crafted or purchased; it didn’t really matter. Eight people were able to get loot four times regardless of whether any of us used the cash shop or not. Additionally, I could have continued to run SAs all night without spending a dime as there was a steady stream of requests for people to join groups. Had I been focused on gearing up through SAs I could have easily done it by using shared keys. Because Shadow Arena keys benefit more than one person, the importance of whether they were purchased or crafted is negated. What matters is that keys are circulating; big spenders and F2P players alike benefit from the general pool of keys available in the game at any given time. Despite the fact that I have spent a little more time exploring club worlds and even joining a Club myself (although I don’t think I picked a very populated one), I still don’t know a lot about them. What I can say is that Club Worlds offer another form of group activity by allowing players to work together toward creating an environment all their own. Some of the worlds I have visited are thematically consistent. Others look like a buffet of nerdy pop culture references. Whatever the group’s intention, Club Worlds provide an avenue for joint activity that is about creation rather than destruction, a welcome change to the traditional MMO end game content. As you can see there are a number of features in Trove that promote a wide variety group activities. Whether you want to craft, build, trade, or take on challenging bosses, there is plenty of opportunity to do so with friends and strangers alike. Based on the design decisions behind these group friendly mechanics and features, I expect this trend to continue as a core part of the game. I certainly hope it does, it’s one of the reasons I find the game so inviting. There is a solid community vibe once you get properly oriented in the game. I hope that gives any interested persons a good overview of Trove’s multiplayer functionality. Next time I’ll be looking at some of the progression systems in Trove. While the game may be perfect for short, casual play sessions, there’s also a lot of character development providing deep gameplay with lots to work on over the long haul. 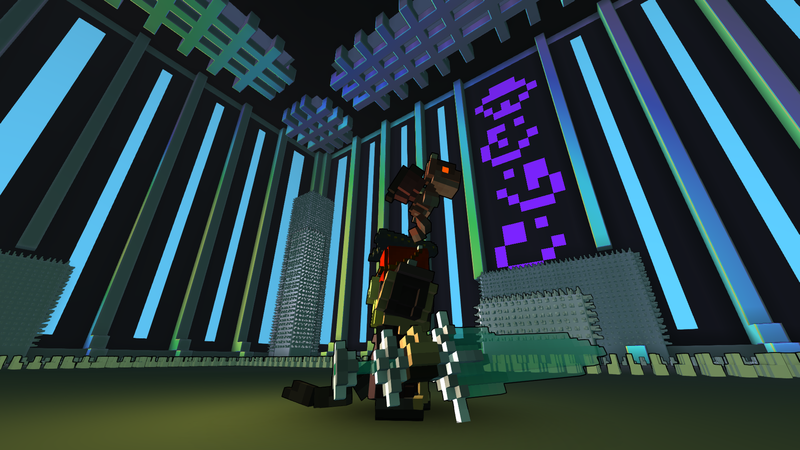 Trove’s end game is not for the faint of heart. Thanks for writing this series! 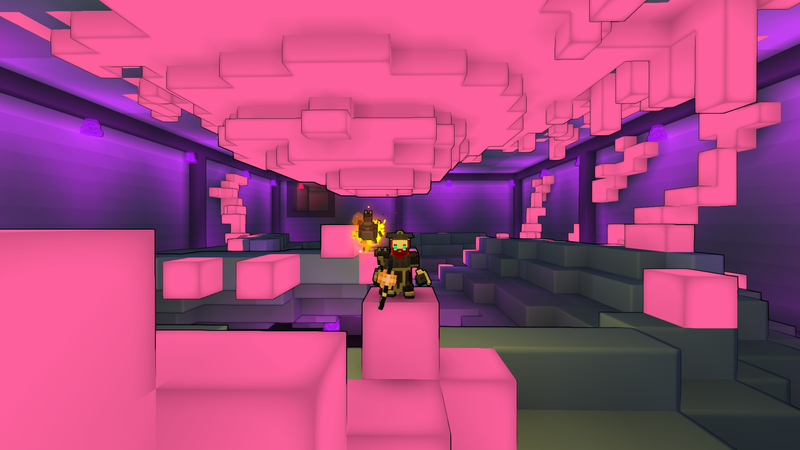 I’ve played Trove since I picked up beta a while back, and hop into it now and then. 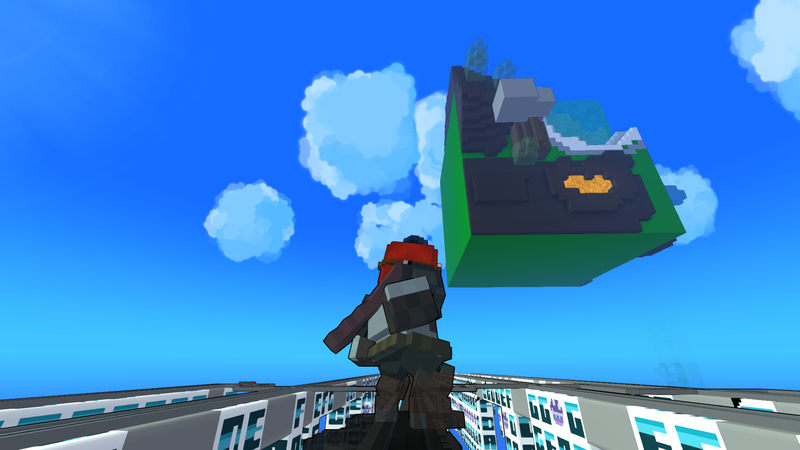 While I enjoy it and actually like the style, I think I’m a little lost as to what I’m supposed to be doing in Trove. I know the key idea of the game is that it’s a random generated sandbox where you just explore and defeat dungeons and such, but I found myself itching for some sort of goal to work towards. I know you level and earn gear, but what is that all good for in the end (I don’t think Shadow Arenas are for me)? Maybe I just don’t know enough about the game to really make my own goals? I never really got excited about the daily dungeons. Often, I’d enter an area and roam around, spending most of my time just to find one that hadn’t already been cleared yet – most of them seem to be. Of course, this is just me at level 4-5… so… Is there really something worthwhile to working on dailies in the end? I love gathering, crafting and building. However, everything in Trove feels like it’s in flux, and not permanent – even placing your own house is only temporary. So, the lack of permanence, while it might be freedom to some folks, is actually somewhat a detractor for me. I’m mildly curious about the previous fish and ships update, though, because I’m a fishing junkie and enjoy ships… but is there something to work towards in that? No problem, and I don’t think anything you said sounded like you were putting down the game. They are legitimate concerns. I think one of the biggest weaknesses of Trove right now is a lack of information. If you haven’t spent a good deal of time playing you won’t know what the game offers or what to work toward. I felt the exact same way the first 3 or 4 times I played (spread out over several months). As for the daily cubits reward, I tried to do it every day just to earn all the classes. Now that I have them all, I’m saving for other things. But basically it’s a way to purchase a few cash shop items for free. And the dungeon density has greatly increased since closed beta. I am swimming in them at every level and never have a problem finding one to do. There is also a litte sword shaped station at the start of every map (in a grey, crumbling tower) that will teleport you to another player on the map so that you can group with someone else if you want. As for what to do, I’ll go into detail in my progression post but honestly the thing I am enjoying right now is the absence of pressure to do anything. I think my love for this game stems from the fact that I am relaxed when I play. I explore, experiment, and casually work toward a few goals, but mosty I just go where the virtual winds take me. I haven’t spent much time fishing, but I do have a lame raft to sail around in, lol. That’s an area of the game I need to explore and I will eventually. One thing at a time! I’ll be sure to write on it when I do. Thanks for your reply! Saving up for other classes makes sense to me. I wasn’t aware you could pick them up for in-game currency. That’s a good tip! Also glad to hear they increased dungeon density. I’ll admit I’ve only played Trove about 3-4 times myself, and put a few hours into it. But that was months ago, so it’s good to know some of my concerns may have been taken care of. I’m looking forward to your progression post, then! I agree that I don’t hear too many people sharing a lot of information about this game yet. I didn’t even know there were raid-like features at end game until you noted it! You sure know how to make Trove’s gameplay sound appealing! Alas, for me the look and feel of the world trumps all, and I have zero interest in a silly world of cubes. Thanks, and I understand. I think a lot of people don’t like the voxel look. I like the vibrancy of color, and personally I think the cube look is nice, but then I still like to play games with more realistically rendered environments and characters as well.